For someone who spends a lot of time in the upper reaches of the charts, Tim McGraw is a maverick who continues to buck trends and constantly puts himself out there musically. Who would've thought teaming up with Nelly would produce chart-topping results? 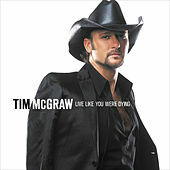 Live Like You Were Dying marks the ninth album for McGraw, and is his most personal-sounding effort to date. Released a few months after the death of his biological father, Tug McGraw, "Live Like You Were Dying" crackles with emotion as McGraw sings, resolute in both his reflective lyrics and his warm tone.